October 1988. In the year since the last blog entry, Margaret Thatcher became the longest-serving British Prime Minister of the 20th Century, just as the Government announced that the Poll Tax would be introduced in 1990. Oblivious that the chain of events that will culminate in her defenestration have been set in motion, Thatcher declares she will remain in power until 1994. Hubris, as ever, will be followed by Nemesis. And in Doctor Who, celebrating the silver anniversary we have Nemesis of the Doctor – sorry – Remembrance of the Daleks. The longest-running science fiction television series of all time is only a couple of years away from its own demise. However, there is nothing in Remembrance that suggests that this is a moribund show crawling towards death. Instead, we get the best story since 1984, and arguably since 1979. Or, not unarguably, the best story ever. Because however good The Caves of Androzani is – and it is astonishingly good – it is by no means a viable model for how to make Doctor Who. 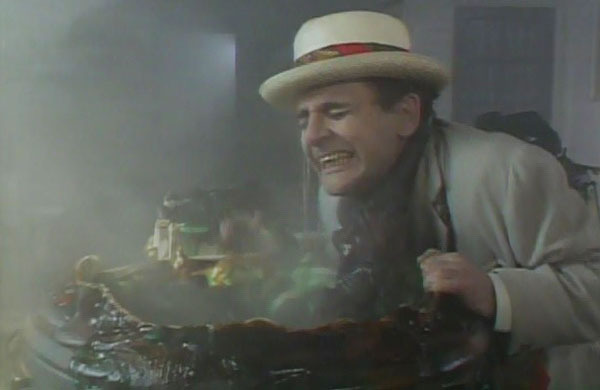 All the lessons taken from it – the cynicism, the violence, the Doctor’s tangential involvement in the story – were ones that helped to wreck Season 22 and ended up poisoning the series just as effectively as the raw spectrox poisoned the fifth Doctor, to the point that a kill-or-cure regeneration was really the only way to go. In Androzani, Robert Holmes shows us a beaten Doctor who’s given up getting involved or trying to avert massacres as a pay off to “There should have been another way” and “I must mend my ways”. Remembrance, on the other hand, presents us with the Doctor the sixth might have been – a Doctor who’s no longer effete, neurotic and incapable of effective action, but one with a plan to put an end to evil, and the energy to follow it through. Given by 1988 Doctor Who was obviously on life support, Remembrance is far, far better than anyone really needed it to be. It has a kind of swagger to it – “I can do anything I like” – that belies the fact this is still a programme utterly unloved by the BBC. It’s a show that’s proud to celebrate 25 years of Doctor Who whilst giving us a new approach to making the show – a new Dalek paradigm if you like. It’s so self-confident that it’s even willing to incorporate Doctor Who the TV series into itself, circling back to 5:15pm on Saturday 23rd November 1963. Remembrance is like the serpent consuming itself, and what it spits out is a synthesis of what most people in 1988 would have identified as the Golden Age – that vague period between the mid-1960s and the mid-1970s when Patrick Troughton worked with UNIT to defeat Davros and his army of Daleks. In other words, a Golden Age that only ever existed in people’s imaginations, one that takes the best bits of this halcyon vision of what Doctor Who used to be, back in the day, and works them into a story that’s not quite like anything that’s gone before. Both Ben Aaronovitch and Sophie Aldred mention that Jon Pertwee was their first Doctor, and Remembrance of the Daleks is superficially like the Pertwee era, with the everyday lives of British people disrupted by alien invasions, and a slightly bumbling military operation aiding and obstructing the Doctor in equal measures. It even opens, like Spearhead from Space (and Rose) with a shot of the lonely Earth from space. The references to “Brigadier” and “scientific advisors” drafted from Cambridge obviously recall the UNIT years, but unlike some of the more laboured continuity of something like Attack of the Cybermen, they’re generic kisses to the past rather than specific references. And there’s an equal mix of epic, Hinchcliffe-era cosmic horror, alien possession and a (literally) buried threat from the past rising to menace the present. Meanwhile, Sylvester McCoy’s written like Tom Baker’s Doctor but plays it like Patrick Troughton – a space vagrant who fights monsters. Beyond that, though, it feels like the whole of Doctor Who is in here, from an unearthly child chanting sinister rhymes in the playground of Coal Hill School to the Dalek Emperor from the TV21 comics to a companion who’s like Leela mixed with Sarah Jane (a violent anarchist revolutionary who’s also the Doctor’s best friend). This is both a historical that’s set within the lifetime of Doctor Who, a “Yeti on the loo”, a Dalek outer-space epic and a Time Lord expose. This is every Doctor Who story ever, including the story of Doctor Who itself. What’s really fascinating is that all of this is perfectly understandable from an anniversary story – but that was actually Silver Nemesis, which aired around 23rd November 1988. Remembrance of the Daleks is just Ben Aaronovitch and Andrew Cartmel setting the tone for Doctor Who from now on. It introduces a Doctor who despises guns, preferring to talk his enemies into giving up, or tricking them into defeating themselves. It introduces the pervasive theme of the McCoy years, that the past has to be paid for somehow, and that the evil the Doctor has to face isn’t just buried horror, but your own buried horrors. This isn’t just a straightforward celebration of the past, but it dares to expose the ugly racism of the 1960s – and perhaps even the ugly racism of some 1960s’ Doctor Who. It has a Doctor struggling with the consequences of his choices, and it ends, like many McCoy stories, at a funeral, with an equivocal and unresolved question about whether one can ever really assess the rights and wrongs of decisions until decades after the event. Just as we judge the attitudes of people in history, so history will judge us. History hangs heavy over this story – not only Doctor Who’s history, which is rattled off in a couple of back-and-forth dialogues between the Doctor and Ace covering the story of the first of the Time Lords, and starting to explicitly link Omega and Rassilon for the first time. But there is also John’s history – an immigrant Londoner rather than an African, and there’s Ratcliffe’s perverse desire to re-live the Second World War and turn the clock back on the immigration of people like John. Right the way through this whole era, the past is something to be confronted. Ace is running from her past until the Doctor makes her face it. The idea behind the “Cartmel Masterplan”, which debuts here, is that the Doctor has been running from his secrets for long enough, and that it’s time to finally face up to some of them. Then there are the Daleks. The Doctor reels off their history to Ace without pausing for breath: “The Kaleds were at war with the Thals. They had a dirty nuclear war. The resulting mutations were then accelerated by their chief scientist, Davros. What he created them he then placed in a metal war machine, and that’s how the Daleks came about.” They haven’t been used this well since 1975, and they work so well here because Aaronovitch boils them down to their most basic nature – racist Fascists, born in war, and bent on conquering and enslaving the rest of the universe. That he manages to make Remembrance a natural follow-on from the increasingly convoluted occasional story arc that’s been going on since Genesis of the Daleks – of the Daleks becoming reliant on logical battle computers, and intent on conquering Gallifrey while in the background Davros schemes to create a new race of Daleks that won’t turn on him – without actually directly mentioning any story other than Genesis is a masterstroke. Chucking in an Emperor, a mention of Spiridon and the invasion of Earth in the 22nd Century means that just as much as this feels like every Doctor Who story, it’s also every Dalek story. Aaronovitch’s genius is that he makes this work effortlessly. After all, Attack of the Cybermen – which has a lot of superficial similarities (a Totters Yard setting, the secret of time travel and every Cyberman story ever) – is a car crash of a story. But whereas Attack is elitist, fixating on the details of The Tenth Planet and The Tomb of the Cybermen and not really adding much that’s new, Remembrance feels universal – even the title suggests that this is about what people fondly remember. The way Aaronovitch mingles the epic battles of Daleks and Time Lords with Mike’s mum’s everyday racism and the clientele of Harry’s café is a tentative step in the direction of the last great Time War and the Powell Estate. The New Adventures, which were the single official continuation of Doctor Who between 1991 and 1996, and particularly the work of Paul Cornell owe a debt to this approach. In turn, those inspired Russell T Davies’ first published Doctor Who story, Damaged Goods, which features the Doctor searching for a Time Lord weapon against a backdrop of recent history and a companion in a doomed love affair. Remembrance of the Daleks was by no means the only way to take the series forward into the 1990s, but it refocused it on the things it does exceptionally well. In so doing, it not only celebrated 25 years of Doctor Who, but also set a direction for the 25 years to come. Next Time: “For the first 19 years of my life, nothing happened. Nothing at all. Not ever. And then I met a man called the Doctor. A man who could change his face. And he took me away from home in his magical machine. He showed me the whole of time and space. I thought it would never end. That’s what I thought.” Survival.